John Keeton, Joe Corkin, Quyen Nguyen and Mauricio Franco are headed to the Big Apple to compete against top tier schools. A team of UH C. T. Bauer College of Business students will travel to New York City for the CFA Global Investment Research Challenge, after beating teams from the University of Texas at Austin, Rice University and other Texas schools. Hosted by Texas A&M, the competition was held on April 19. This is Bauer’s first year of participating in the prestigious competition sponsored by the Chartered Financial Analyst Institute. The Bauer team will now compete against representatives from other top tier business schools such as Babson College, the winner in the New England regional challenge. “The obvious effort the presenters put in, and the quality of their performance, make me very proud of what our students have made of this year’s program,” said Dr. Tom George, Finance professor and Director of the AIM Center for Investment Management. 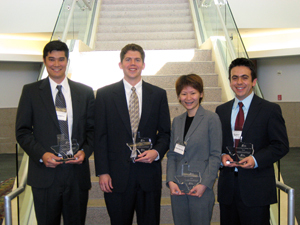 Members of the winning team include John Keeton, Joe Corkin, and Quyen Nguyen, all graduate students in Bauer’s College Finance department, and Mauricio Franco, ’04, a CPA and MBA candidate. The team was given a company to analyze – Men’s Wearhouse — less than three months before their winning presentation. Working with assigned mentor Pearce Hammond, with Simmons and Co., the four students put more than 100 hours into a written analysis of the company and presentation. When the Bauer students presented their findings to the judges, and answered questions afterward in a Q&A format, their expertise and poise were showcased, George said. About their win, “Both teams were so strong, I think it comes down to intangibles,” he said. “Our students are more comfortable in the presentations. Our students work full-time and have more business experience and a better world view than most students do. They’ve got to juggle the demands of working and going to school and it takes a lot of maturity to do that. “There really is an advantage to having people work and go to school part-time and it makes for value added for a degree program like ours,” George added. Keeton also credited the value of participating in the AIM Center’s Cougar Fund, a private, multi-million dollar fund managed by student advisors. “This competition meant a great deal to us,” Keeton said. “With all of us being in the Cougar Fund, we have all had experience in analyzing the valuation of companies. We all have truly appreciated this opportunity and have enjoyed the experience, and all of us want to advance our careers in the investment/securities industry. In addition to funding their trip to New York City for the May 1 competition, the CFA Institute will waive team members’ fees for the Level I Chartered Financial Analyst exam. The University of Houston, Texas’ premier metropolitan research and teaching institution, is home to more than 40 research centers and institutes and sponsors more than 300 partnerships with corporate, civic and governmental entities. UH, the most diverse research university in the country, stands at the forefront of education, research and service with more than 35,000 students. The C.T. Bauer College of Business has been in operation for more than 60 years at the University of Houston main campus. Through its five academic departments, the college offers a full-range of undergraduate, masters and doctoral degrees in business. The Bauer College is fully accredited by the AACSB International – the Association to Advance Collegiate Schools of Business. In August 2000, Houston business leader and philanthropist Charles T. (Ted) Bauer endowed the College of Business with a $40 million gift. In recognition of his generosity, the college was renamed the C.T. Bauer College of Business.